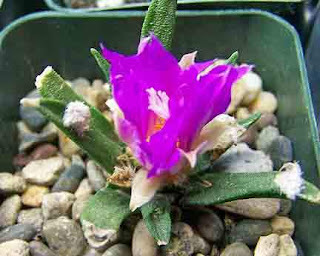 Normally we expect to see blooms on our Ariocarpus agavoides in mid-summer, but they sometimes surprise us with a flower in November or December. Highly prized by collectors, these are almost extinct in the wild due to over collection. It's a shame that this continues to happen as they grow quite readily from seed. We're quite happy with most of our seedlings this year. We don't do a lot of seed growing. We just don't have the space. 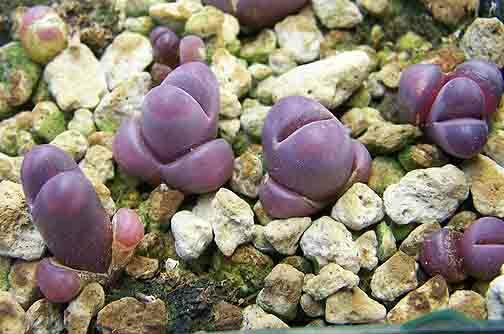 But we do grow some, like these little seedlings of Lithops lesliei 'Albinigold' ex. 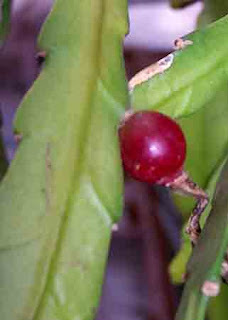 c36B, seeds from Mesa Gardens. 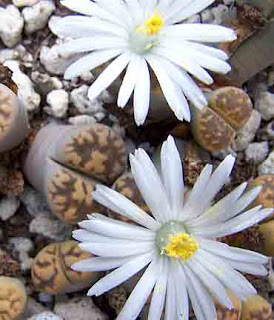 Everyone should grow some Lithops from seed. It's so much fun seeing them mature from little tiny dots. 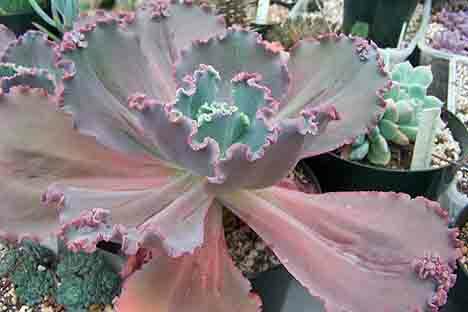 Another one of those fantastic, frilly-leaved Echeverias. We weren't sure the name was correct when we first got this plant, but it appears to be correct: Echeveria 'Mauna Loa'. And wow, what a show! 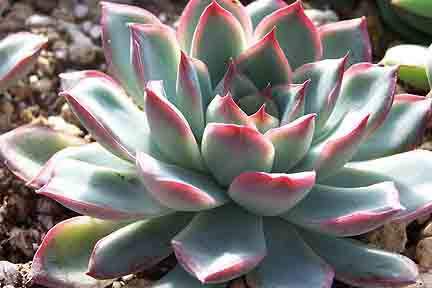 Unfortunately, most of the fancy Echeverias, being hybrids, don't come true from seed. 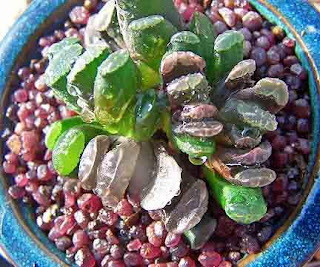 We use both leaf cuttings and top cuttings to produce our plants, depending on the species. 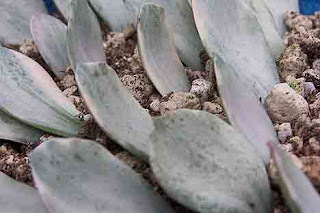 The following is a tray of leaf cuttings of Echeveria gibbiflora 'Decora'. It's that time of year and the "Holiday Cacti" (Schlumbergera) are showing their colors. We don't grow these plants commercially; we just can't resist them and they keep multiplying. 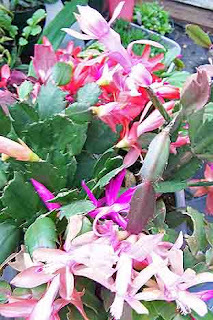 Notice I didn't call them "Christmas Cactus" because they aren't. They bloom whenever it pleases them during early winter. 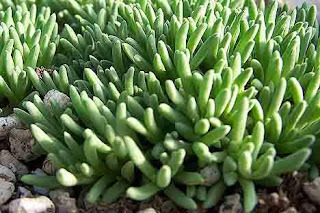 And our care for them is pretty haphazard: they get placed under the bench where we forget all about them except to get watered once in a while. Until, that is, we glance under the bench and - lo and behold - the whole trays are filled with flowers. 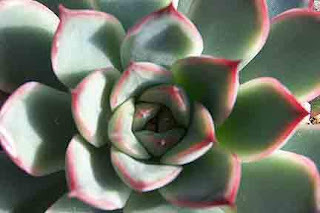 Yesterday - or actually very early on Tuesday - I said I'd get back to the Echeverias today, but the photo I took turned out blurred. So...later. I'll be getting up in about three hours to go check the greenhouses. It's quite cold out there and we're fairly low tech. Meaning that I get up at 3 or 4 in the morning to go check the heat in the greenhouses. Soooo...later. 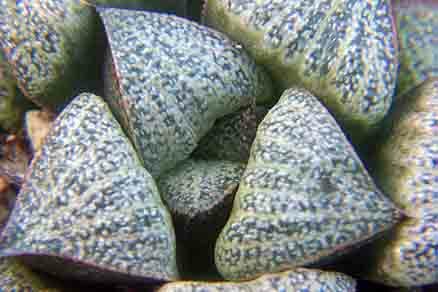 Just beyond this one bunch of Echeverias is section full of Lithops. This one's one of my many favorites, Lithops karasmontana ssp. bella. Like Rika in Germany, the weather hasn't really been cooperating here and sometimes it's hard to get light bright enough to get a good photo. However, it's clear out now and the nighttime temperature will be dropping to levels much below the normal for this time of year. And tomorrow night we'll probably get way, way below normal, with temperatures dropping down into the teens (F) (about -8 C). But we only got a light dusting of snow. 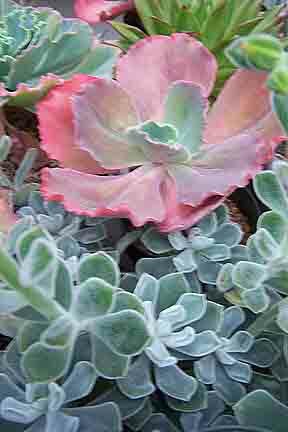 More about the Echeverias tomorrow. It's way too late tonight to be posting anything, but here's a quick one anyway...a selection of Echeverias. 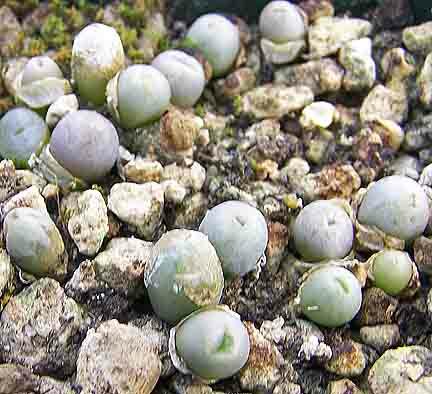 These just caught my eye as I went past them on the way to photographing some Lithops in flower and to do some work on winterizing the greenhouse. I took some other pictures but they'll just have to wait. More tomorrow. Enjoy your plants. It may just be my age, but there don't seem to be as many hours in a day as there used to be. I have about a six course meal of things to do each day, but most of the time I barely make it past the appetizers. And this blog has been getting shoved to the background. My apologies. But there have been orders at the nursery to take care of, potting mix to mix, greenhouses to insulate. And we also have been trying to be very diligent about getting in at least 30 minutes of brisk walking a day. And then, of course, there's the room I'm building in the basement for our grandson to move into. Plus, it appears that I'll be taking on a quarter-time job as a Community Developer for the Woodlawn Community Resource Center. And I admit, we do always - or at least almost always - take time out each morning to go out for a latte. And, Oh yes, did I tell you...I'm supposed to be retired. (Please don't send sympathy cards (: --- I'm just venting. I'll try to get back with some more photos soon! Here's another H. magnifica var. splendens, also seed grown. This one is from a different locality, GM452, another gem of a plant. It will also be going up on E-Bay soon. 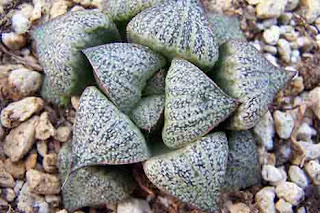 We have a couple of seed grown Haworthia magnifica var. splendens GM447 that are finally of size that we'll be selling them on E-Bay. We also have a H. magnifica var. splendens GM452 available. This is GM447. It's developing a nice porcelain-like surface which is so much desired and has some very nice markings. Enjoy. Some of the best plants for color in the Fall are the Echeverias. These are a couple of new photos of Echeveria pulidonis taken Sunday by Lynn-Marie. We have lots of photos of these, but each new image seems to catch something more of their character. 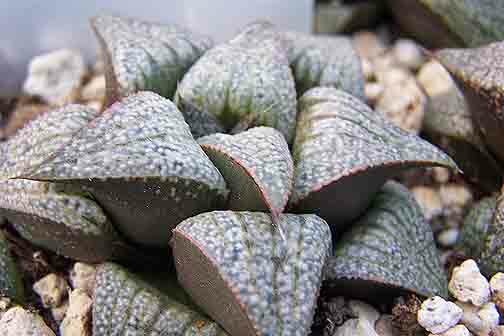 Today was a very drab, gray day; a few minutes in the greenhouse with these plants helps make the day look a lot brighter! 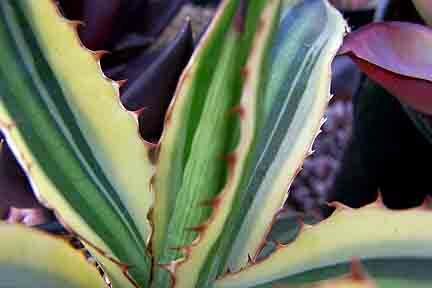 Another group of plants which gives us color when there aren't many flowers are the Agaves, and one of my favorites is Agave lophantha 'Quadricolor'. It's one of those plants which improves with age. And it stays relatively small so it doesn't crowd you out of house and home. 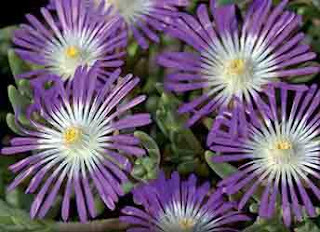 This is a nice hardy ice plant which has gorgeous purple and white flowers - Delosperma floribundum 'Stardust'. Give it bright light and soil with good drainage and it can brighten up some bare areas in the landscape. USDA Zones 6, 7 & 8. A beautiful day today; almost like the summer we didn't get! And that got Lynn-Marie going with the camera. 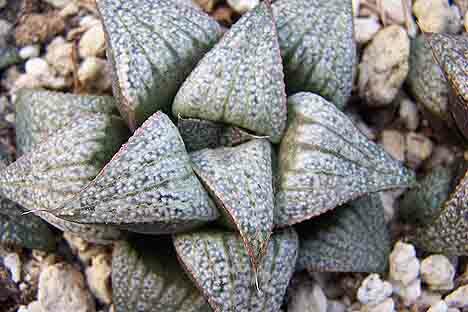 This clump of Haworthia truncata had just been watered and it's loving the (temporary, I'm sure) warm weather. This is a small growing form in a small bonsai dish. At this time of year it's mostly mesembs and Lithops which are flowering. But there are other places to look for interest other than flowers. Some of the plants themselves begin to show their leaf colors better than during the heat of summer. And then there's the occasional seed pod, like on this Epie. This one is Epicactus 'Delicate Jewels'.